Menorca’s fiestas are a centuries-old tradition and are celebrated in grand fashion by the island’s inhabitants, who welcome all holidaymakers to join in the fun, much of which is fuelled by Pomada, a mix of Mahon gin and lemonade. The stars of the shows are the magnificent horses and their skilled riders, who charge through the crowds at speed and rear up on their hind legs while the bravest among the crowd try to touch their hearts. Yes, it’s insanely dangerous but a great spectacle. There are fun fairs, street music and food, fireworks and much merriment. Each town has a different take on the fiesta, and they vie with each other to provide the best entertainment. Be warned that shops in the town will often close for the duration of the celebrations. 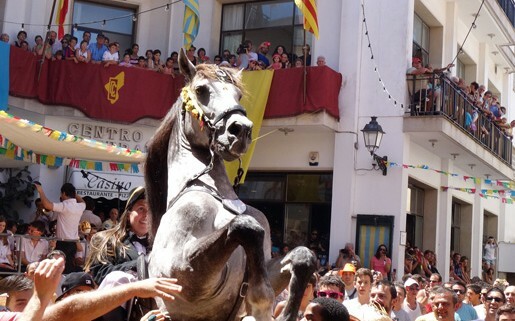 The biggest and most popular of all is Ciutadella’s Festes de Sant Joan.